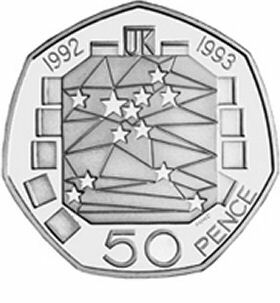 The UK Council of Ministers Presidency and completion of the Single European Market design is the rarest 50 pence coin in circulation and has a value of 50 pence, but collectors of coins currently pay £60.00* to own this coin. Do you have one to sell? : Recent sales of this coin on eBay achieved £60.00 to £62.00 based on a sample of 174 sold items, taking the mid price* and a 10% range of ordered prices.